Sugar Fix Dental Loft is celebrating the first anniversary of its stylish, informative, and highly successful dental website from Roadside Dental Marketing. The dental boutique has welcomed hundreds of new patients through referrals from the site, which features a distinctive pink-and-white-striped background. Over the course of the past year, Dr. Jessica Emery has continued to enhance the site with new content, providing patients and the media with the most up-to-date information regarding her practice, procedures, accomplishments, and promotions. Among the most notable features of the website are its videos, in which the practice’s Chicago patients speak about the porcelain veneers and restorative dental treatment plans created and carried out by Dr. Emery and her team. The launch of the website has helped to shine the spotlight on the Chicago cosmetic dentist. She has been featured in several highly regarded publications such as, Crain’s Chicago Business, Chicago Social, and Michigan Avenue Magazine. Because the Chicago porcelain veneer and restorative dental expert and her team have incorporated social media features into the website, they are now able to instantaneously interact with patients and extend advice, encouragement, and a friendly hello. The goal of the dental loft is to provide a wide array of customizable services and a superior level of patient care. Dr. Jessica Emery is committed to enhancing the dental experience of her patients’ and augmenting their oral health by offering general, cosmetic and restorative dentistry services in a fun, welcoming, and relaxing environment. The dentist and her porcelain veneer smile makeover team in Chicago continue to broaden their knowledge of technical advances in modern dentistry by routinely participating in advanced studies programs around the country. 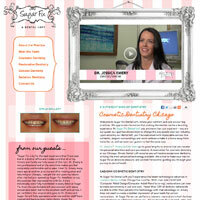 Sugar Fix Dental Loft is located at 3346 North Paulina Street, Chicago, IL, 60657. To learn more about the dental loft, contact Dr. Jessica Emery via email, or call (773) 883-1818, today.